I was traveling a lot for work and when I had to spend the week before Memorial Day weekend in Atlanta, I invited Lisa and Kellisa to join me. It was a mini vacation. I could join them for lunch and evening swims after dinner. 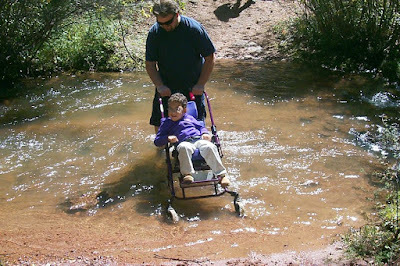 I started researching hikes with wheelchairs. I found a short accessible trail leading to a viewpoint of the highest waterfalls east of the Mississippi only an hour from Atlanta. Finished with work, we drove to the trail on Saturday morning. I was bursting with excitement. I found a hike I could do with Kellisa. It was a beautiful trail and I easily pushed Kellisa to the viewpoint. The waterfall was breathtaking. The endless mountain views were awe inspiring. Kellisa was having fun. This was Kellisa’s first wheeled hike on an accessible trail. I was disappointed beyond belief. The trail was short and easy. I should have been happy, on top of the world ecstatic, but all I could see were the other trails in the park. The real trails. The trails not meant for wheelchairs. We drove to another trail that led to a different viewpoint of the same waterfalls. This trail was the exact opposite of accessible, it was steep, muddy, and full of rocks and tree roots. I became determined or possessed. I pushed Kellisa in her wheelchair up this crowded trail full of weekend hikers gawking at us. A few hikers offered to help, but I needed to get Kellisa to the viewpoint without help. I needed to test our capabilities. 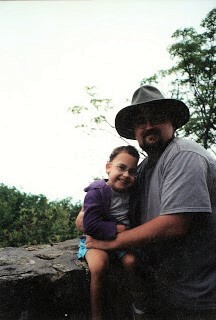 Kellisa’s endless giggles provided additional motivation as I struggled, but we made it to the viewpoint. Kellisa was probably the first (and still only) person in a wheelchair to see the waterfalls from this platform. Then I realized the scary fact that the hike was only half over. I had to negotiate this trail going down hill where mud and gravity are known enemies of a wheelchair. Like Mount Everest mountain climbers, is it considered a successful climb when you reach the summit or when you return home alive? I was praying to make it down without Kellisa getting hurt. I was even promising to never try anything like this again. We made it down and Kellisa was all smiles and giggles. I had no business pushing Kellisa on this trail...on that day as we were ill-prepared. I kept my promise, we've never done anything like that trail again. Now we use adaptive mobility chairs designed for trail use and I tether Kellisa to my body to prevent gravity from taking Kellisa down. Later that same day, we visited Brasstown Bald, the highest point in Georgia. After driving most of the way towards the top, it was a half mile climb to the summit observation platform. We arrived with little time before the park closed and a ranger advised us to come back another day. We didn't have another day, so I carried Kellisa to the top before posing for Kellisa's first state highpoint picture. We took in the view for a few minutes before racing back to the van so we could leave before getting locked in for the evening. Not only was Kellisa a hiker, but now she was also a state highpointer! We ended our summer with Labor Day weekend visiting family in Colorado where we went for Kellisa’s second "real" hike on wheels. It was a rocky trail surrounded by mountains with a swift flowing stream that needed to be crossed. Lisa didn’t want me to push Kellisa through the water, but I couldn’t resist another test of our adventure skills. In the middle of our crossing, I looked back at Lisa with a nervous smile. If looks could kill, I would have died that beautiful afternoon. 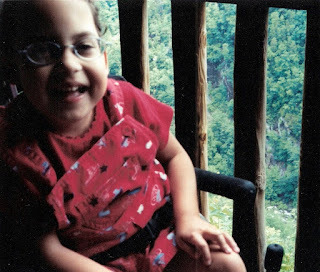 In between the two hikes, Kellisa had her only surgery of 2004. Her tonsils and adenoids were removed by laser to clear her breathing path. We were able to add another doctor’s name to the “astonished by Kellisa” list as one of her tonsils improbably grew back. 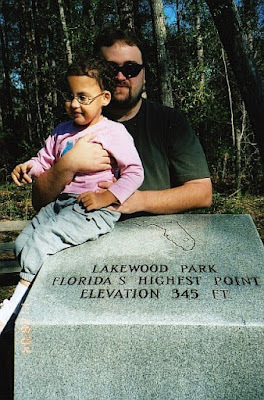 We squeezed in one last adventure for the year when we visited the highest point in our home state of Florida. It was an easy drive up in a park with a short walk to the summit marker.